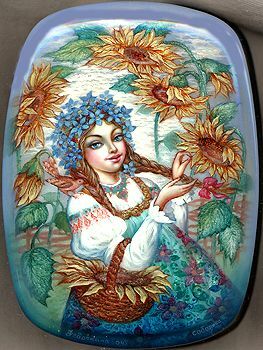 This portrait of a girl strolling through the sunflower field was painted by the talented Fedoskino painter Tamara Soboleva. She is dressed in the traditional costume of a Russian peasant woman. Her head is covered with the wreath twined of blue field flowers. She touches the large golden blossoms admiring the beauty of these gorgeous flowers. Here the artist makes fine use of the overlay method of application. This procedure helps her to develop texture and three dimensional features throughout. A magnificent effect! The bright golden blossoms of sunflowers contrast beautifully with blue greenish tones of the girl's costume and the surrounding landscape. The box gleams richly with a combination of mother-of-pearl, gold paint and aluminum powder. Using mother-of-pearl and gold paint the artist achieves luxurious texture of the sarafan. Gold paint is also used to paint the sunflowers. Using aluminum powder the artist highlights the girl's sarafan, the foliage of sunflowers and the white background. The sides of the box are decorated with a wide ribbon composed of relief gold patterns that resemble a cobweb. This ornamentation is original and elegant. The box is constructed of paper-mache. The interior of the box is covered with red lacquer, the box's exterior is covered with black lacquer. A hinge is fastened to the left of the lid. The box rests flat without feet. It is signed and titled by the artist.